While Ireland had a system of tracks and roads from ancient times it wasn’t until the 17th and 18th centuries that the development of ‘stone roads’ really commenced. In medieval times many roads were upkept under ‘the parish 6-day system’ – ruling land owners were obliged to supply men to work on the roads in their area for 6 days each year. Other roads were constructed following grants of monies via ‘the Grand Jury system’ while from c. 1729 numerous roads were constructed via ‘the turnpike system’…not unlike today’s ‘public private partnership’ (PPP) system where tolls are used. Accordingly, while nothing of the standard of today’s new motorways Ireland had, by the late 1700′s, a quite detailed developed ‘main’ (or ‘trunk’) road system throughout the Island – particularly between main cities and ‘market town to market town’. However, while some mapping of Ireland’s road infrastructure had been undertaken prior to this time (mainly by some leading large landowners), no detailed road maps had ever been produced…until the arrival of two Scottish ‘cartographers’, George Taylor and Andrew Skinner, in c. 1775. Within two years, they, with their team of highly skilled surveyors and engineers and with the most technologically advanced systems, processes and equipment of their time, completed their mapping of all Ireland’s main road infrastructure – on 14/11/1777 and in ‘vertical strip’ format they produced the world’s very first road map for an entire country. With a 2-page introduction, 14-page index and 288 pages of maps their original publication showed county boundaries, market towns and villages plus topographic details like rivers, lakes, forests, hills, bridges, castles, churches, mills etc. They also included the names/seats of the main landlords, nobility and gentlemen’s ‘big houses’ at the time. ‘Irish’ mile markers (from Dublin Castle) were shown – plus an ‘English’ (Statute) mile conversion chart…11 Irish miles equalling 14 British ones! They also showed where ‘turnpikes’ were located – the old 18th and 19th century ‘toll’ stations. After completing their Irish road maps Taylor & Skinner travelled to the New York & New Jersey areas of America in c. 1780 where they undertook mapping and survey works relating to the American Revolution. 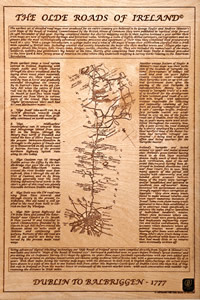 Utilising an original copy of this old manuscript and utilising advanced computer technology and processes Olde Ireland has now pieced all these vertical strip maps pages together thus making what’s believed to be ‘The World’s Oldest Road Map’ for an entire country’. 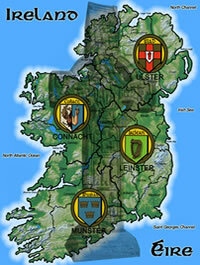 Now EVERYONE, whether in Ireland or in any other country worldwide, can obtain a copy of this unique map – or any section of it…permanently laser engraved (permanently burnt into) on a variety of solid materials like granite, marble, slate, hardwoods, glass/mirror, stainless steel, anodised aluminium, cork etc. They can also obtain an A4 or A3 size engraving of the complete road map – as one…or to any size in ’tile format’.